Enviromotive.Net - EvacuBlast DPF Cleaning Equipment, Filters, Gaskets, Clamps and More! Call Us At 800-954-8265! Our state of the art DPF Cleaning Inspection / Flow System is designed to measure flow before and after cleaning a DPF from any system. The Flow Meter can also distinguish a bad DPF that may be exothermed, cracked, or damaged, allowing containments to flow through the Diesel Particualte Filter. Simply turn on the High Powered Halogen Light and look down the DPF. I’m interested in a price and availability of your EvacuBlast -9004 Flow system. does this take a pressure reading and if so please explain. 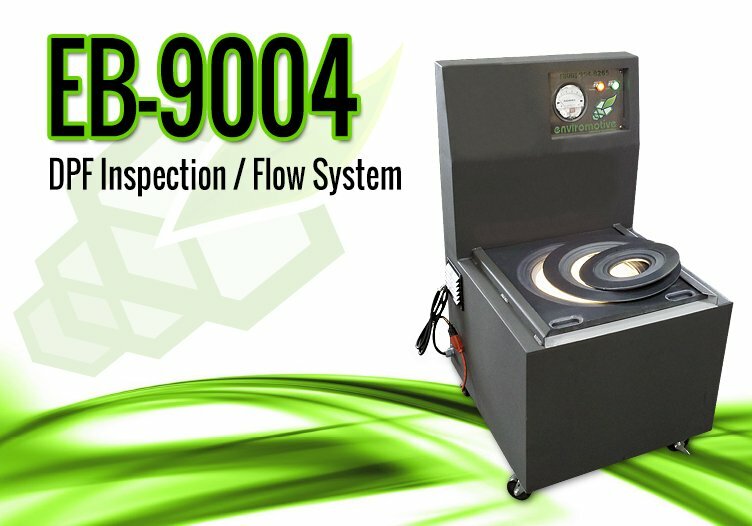 We are currently using your EvacuBlast EB9004 DPF inspection/flow system. I am looking for a manual on using this machine and testing DPF for what we should be looking for . Not sure what they did with are information we had. If you could e mail me a manual I would appreciate that. we are a well established company in uk,specialising in remanufacture of turbochargers and diesel injectors.now we are starting to go into dpf filters cleaning.so we are intersted in evacublast–9004 dpf,inspection flow system.so we can check before and after,for the flow on dpf filters.can you please send us more information how does it work on this flow machine and also give us your best price on it.thank you. we are a well established company in uk,specialising in the remanufacture of turbochargers and diesel injectors.now we are going in to cleaning of dpf filters.we are intersted in evacublast-9004 dpf.can you send us more information how it tests the dpf filters,and also give us your best price.thank you. Would love to have a price. Is the differential pressure gauge measuring in PSI? If not, what is the vacuum gauge measured by? Thanks! Hi starting up dpf cleaning company and need a flow bench and possibly a blast Cabinet. Need to know what costs are involved for the products. Thank you. Please send us your email to jim@tanksalot.net and we will respond.